Dubu kimchi is a popular dish made with old kimchi. This recipe is simple and easy! 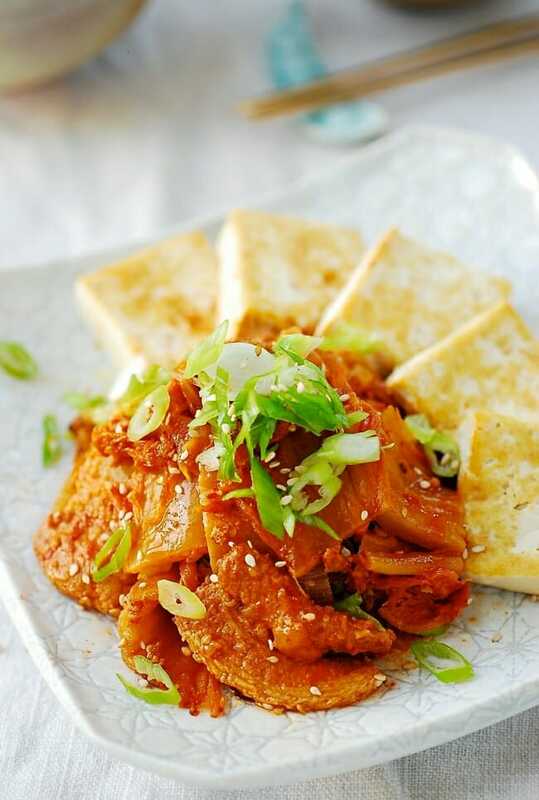 Stir-fry the kimchi and pork and serve with sliced tofu that has been boiled or pan-fried. Simply omit the pork to make it a meatless dish if you like. What’s your favorite way to use up aging kimchi? Dubu kimchi (두부김치) is one of many classic Korean dishes that use sour, old kimchi. 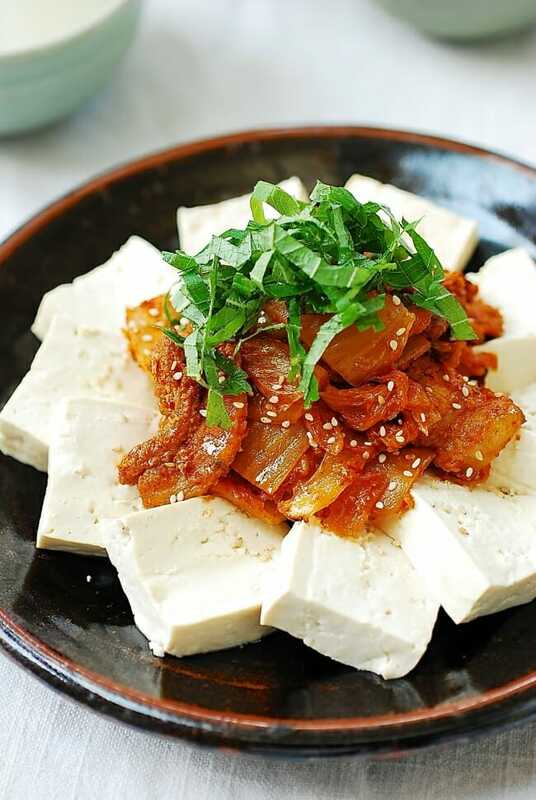 The kimchi is stir-fried with fatty pork and served with sliced tofu. 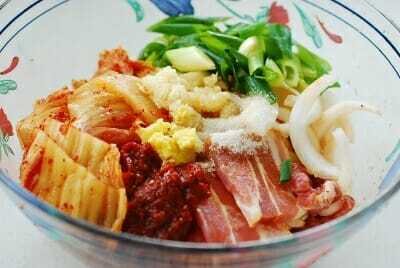 In Korean cooking, kimchi and pork is a classic combination which is used in many different dishes, such as kimchi jjigae. The taste is intoxicating, with the pungency of kimchi and the rich flavor of fatty pork. 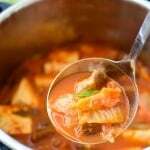 This easy dubu kimchi recipe was originally posted in October 2010. It’s been very popular, but I’ve updated it here with more information, new photos and minor changes to the recipe. To make dubu kimchi, mix the kimchi, pork and aromatic vegetables with a few basic seasoning ingredients and stir-fry together. You can omit the pork to make it a meatless dish if desired! Kimchi stir-fried on its own is still very tasty. 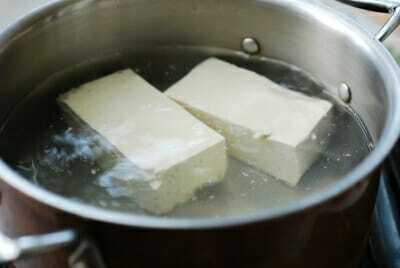 I usually boil the tofu because I like it soft. You can also steam it. Pan-frying will make the tofu a little crispy on the outside, if preferred. You can serve this dubu kimchi as a side or a main dish with a bowl of rice. In Korea, dubu kimchi is a popular drinking snack (anju, 안주), especially with Korean alcohol beverage soju (소주) or makgeolli (막걸리). 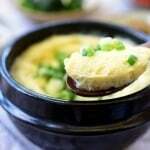 My preference is with makgeolli! Did you make and love this dubu kimchi recipe? Please rate the recipe below by either clicking the stars or with a comment! And make sure to share your creations by tagging me on Instagram! Stay in touch by following me on Pinterest, Twitter, Facebook, and Instagram. 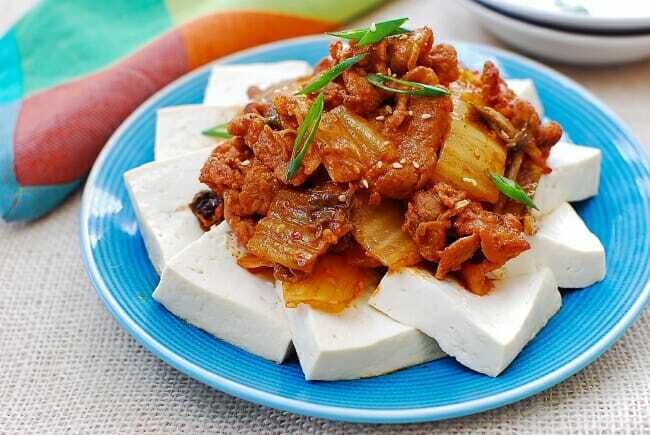 Kimchi is stir-fried with pork and served with sliced tofu that has been boiled, steamed, or pan-fried. Cut kimchi and pork into bite sizes. Thinly slice onion and scallions. In a large bowl, combine kimchi, pork, onion, scallions and the remaining ingredients and mix well. Let it stand for 15 minutes. In a medium size pot, bring about 4 cups of water to a boil. Cut the tofu into two blocks. Reduce the heat to medium high, and add the tofu. Gently boil for 5 minutes. Carefully transfer the tofu to a colander to drain. Cut each block into about 1/2-inch thick slices. Heat a large pan over medium high heat and add the kimchi and pork mix. Cook until the kimchi becomes soft, the pork is cooked through, and most of the liquid generated during the cooking process is evaporated, about 5 - 6 minutes. Arrange the tofu slices nicely on a plate leaving an open space in the middle part. 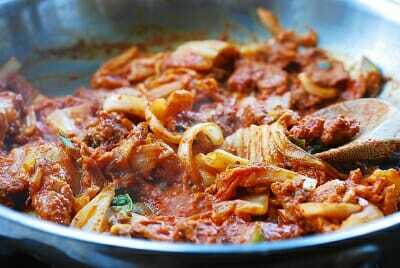 Place the stir-fried kimchi and pork in the middle and serve. Or, you can serve the stir-fried kimchi and tofu side by side. Ooo, this looks SO good. I don’t really like kimchi that much (I know… and I call myself korean?!) but I do like it cooked like in kimchi bokkeum bap. THIS dish looks absolutely delicious. I’d totally eat this for days on end! I always make kimchi bokum with my leftover kimchi. Great blog post on what to do with that kimchi that is just a little too ripe! I love this dish. As you stated above it is intoxicating(in a good way). Thanks for the great post! Anything kimchi I eat. And I love this recipe. Makin my mouth water as I write. And just recently my son has taken a liking to kimchi and now asks for it. Oh my goodness!! 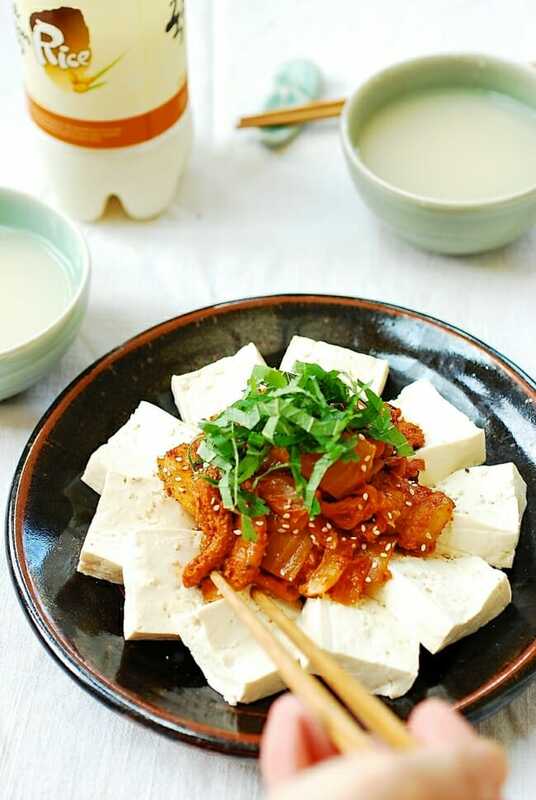 Such a treat to have tofu and kimchi in the same dish – I love it! I was going to make kimchi jigae, but then saw your recipe and since I had all the ingredients, decided to try it. It was so good! My Korean husband liked it too. Your recipes are very similar to how my mother-in-law cooks. Thanks! Jean, Roxan, Fun and Fearless, Susan, Lisa, Biren, and Denise – Thank you so much for stopping by and sharing your love for this dish. Judy – Yes, I make my own kimchi. I guess I am one of those typical Korean moms who make a lot of kimchi at a time and supply to their grown-up children. kimchi can last several weeks or months in the fridge. 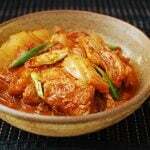 The flavor will develop over time and reaches its peak around 2 to 3 weeks after kimchi is made. You’re right it turns sour at some point, but that’s the best kind for kimchi stew (jjigae), pancakes, dumplings, etc. Judy – One more thing. Kimchi brands vary depending on where you are. There are some national brands too, but since you’re in LA, the best city for Korean food, there should be a lot of good local brands. Sometimes the best kind is the one that is made right there at the market. Hope this helps. wow, amazing photo and recipe! Confession~ I’ve never made kimchi! But I’d be willing to try it to eat this! i love food like this, especially with a bowl of white rice. very comforting and delicious! YUMMO. 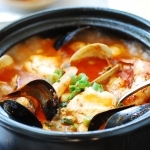 I had a similar dish @ A Korean restaurant a few days ago.. and gee it was yummy! 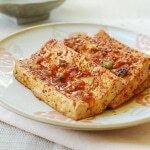 I am not usually a Tofu fan.. but having it with yummy Fried Kim-chi was such a treat! Thank you! I made this as your recipe instructed. DELICIOUS! Thank you! Bliss Bunny – I am glad to hear it turned out well for you. Thanks for giving it a try! I’ve made this at least twice now and I really enjoy it. Thanks for sharing all these lovely recipes! Thank you, Jasmin! I am very happy to hear you are enjoying my recipes. Cheers! I just made this tonight for the first time and it was delicious! My hubby and I finished the whole plate. Thanks! So glad to hear that. Thanks for letting me know! Hi Yeni – I am happy to hear it turned out well for you. Yes, you can add a little bit of water or preferably juice from kimchi to make it saucy. Also, I like it almost caramelized, but you can cook a little less to keep some of the liquid generated during the cooking process. Happy cooking! I love this dish! So yummy! I enjoyed the overall taste of this, but it came out too saucy for me. When the meat mixture was cooking there was a lot of liquid so a lot of steam produced, and it was very soft vs more caramelized. How can I prevent this? Could this recipe be adapted for a more Chinese stir fry process? Where I would cook the pork most of the way, transfer to plate, and vegs and then pork again. I am not quite sure the best way since you have the meat and vegs both mixed in the gochujang, soy, and sesame. Hi Steve – Thank you for trying out the recipe! There’s really not much liquid in this recipe. Did you heat the pan hot before adding the kimch/pork mixture? Did you cook over medium high heat? If you did, try to use high heat next time, at least for the first couple of minutes. Then, reduce the heat as necessary. Also, if the pan is not big enough, cook in two batches. The pan may not be hot enough if overcrowded. I don’t recommend cooking the kimchi and pork separately. The kimchi tastes much better cooked with fatty pork. Please try it again and let me know if this helped. Cheers! Thanks! I’ll give it another try. My Wok did seem a bit crowded. I’ll cook it in batches next time and use higher heat. I usually forgo meat because I don’t have the money for it. >_< But I made with with some eggplant, and the flavor was really amazing. Thank you so much for the recipe! Wow that’s great to know. Never thought of using eggplants to this dish. I love eggplants, so I should try. Thank you very much for letting me know. This looks like what I had for lunch today made with pork belly. Absolutely the most delicious thing I have eaten for ages! The hard part about trying to prepare it at home will be not eating the kimchi before it is fully ripe. Hi Barbara! So happy to hear you and your husband enjoyed dubu kimchi! We love it too. And thank you so much for such generous words! So delicious!! Question, if I’ve made it too spicy, is there anything I can do to make it less spicy? How about stir fry some onions and mix with your pork kimchi. Or cook some more pork and then add to what you already have. In both cases, you want to cook your addition and then quickly stir-fry everything together to heat up. Hello! I’ve made this twice and followed the recipe exactly. I am not a regular cook of any kind of cuisine but my elderly Korean parents who were visiting absolutely LOVED this. My mom insisted that I write down the recipe for her (she doesn’t use the internet) so she could make it herself at home. Thank you for this easy and scrumptious recipe!